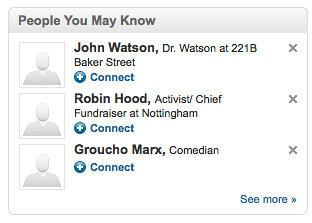 Logging into LinkedIn today I noticed an interesting selection of People you may know. As these people will probably all disappear after today, I took screen captures for you to have a look at in the future. You can find the PDFs below. 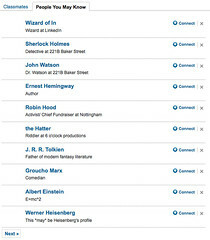 This entry was posted in Web sites and tagged April Fools, LinkedIn, social network, website. Bookmark the permalink.